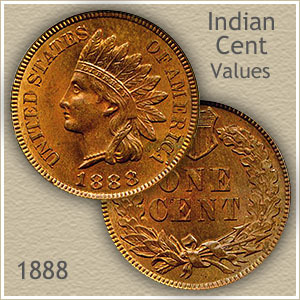 Your 1888 Indian head penny value is often higher than average because of its condition. Your coin may be worn, the design somewhat faded, however today it is desired by many. A nice 1888 penny is worth a premium to those assembling collections of Indian pennies. Important to value, special attention is placed on condition. Examples displaying the greatest detail are in demand and command a strong premium. Pictured is a penny in "uncirculated" condition. It represents the top quality that commands the highest price, approximate value of this 1888 Indian penny is $60 to $75 because of outstanding quality. Your old penny may not be as choice as pictured, however looking closely at your coin examine her neck just above the shoulder, if you clearly see a necklace and the beads are separated it indicates a high "grade" collectible. 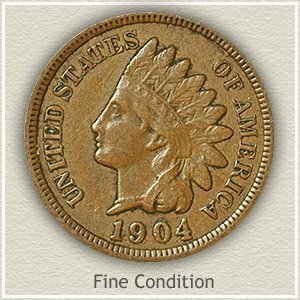 Additional details on grading the condition of your Indian penny are just below the value chart. Exceptional collections of Indian pennies contain interesting, visually attractive coins. Pictured is an 1888 penny many collectors would agree has the eye appeal necessary to qualify for an advanced collection. First, there are no distracting marks on the coin marring the lustrous fields and designs. Also impressive and desirable is the very bold strike, rendering the smallest of details. Visually highlighting it all is the deep red and violet natural toning with gold encircling the rim. 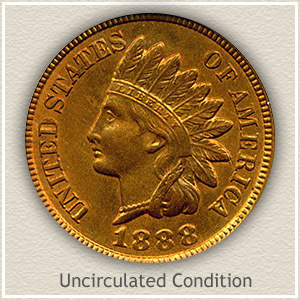 Value of the rare 1888 Indian penny was decided after multiple bids were placed in a David Lawrence rare coin auction. This coin was worth $287 to a determined collector. Solid demand for a quality, well preserved old penny. 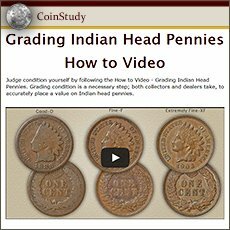 With 1888 Indian head penny value rising quickly for better condition coins, accurate "grading" separates a coin worth a few cents from the twenty dollar penny. Judge your coin comparing to the images and grading descriptions. Uncirculated: Total absence of wear is required to reach the lofty "uncirculated’ grade. Original mint luster is still visible over the entire coin. By tilting an uncirculated penny side to side, unbroken luster rotates across the surface. Also, inspect the high points of the design for evidence of wear. A dulling and smoothness of the surface on her eyebrow, cheek and the ends of the feathers is an indication of slight wear. Heavier wear is noticeable by flattening of normally curved contours. 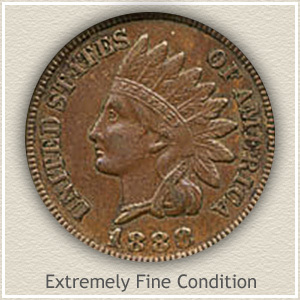 Extremely Fine: An 1888 Indian penny in "extremely fine" condition is well defined in all areas of the design. Boldly rounded and separated are the hair curls and headdress ribbon below her ear. The headband remains very detailed with every letter in "Liberty" complete and sharply defined. Overall a nice coin with some light wear that does not detract from its appearance. Good: If a coin has received extensive wear it is referred to as "good" condition. As your scan travels around the rim, it is important all lettering is visible. Although the portrait is very worn and almost smooth the bold design with headdress is clearly separate of the surface. Her facial features are very faint, the eye does have some depth and the cheek is faintly separated from her neck. 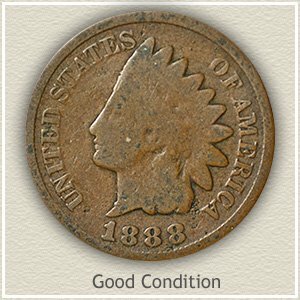 Your 1888 Indian head penny value may be at the low end of the scale but because of its popularity someone would find it collectible. Common dates mostly those in the 1900s are now worth one dollar each. You have a popular coin, everyone understands and has heard of the value of an Indian Head penny. Many collectors are building collections and putting a heavy demand on very rare dates and better condition coins. Compare your 1888 Indian head penny value to other dates on the values chart. All old US coin values. 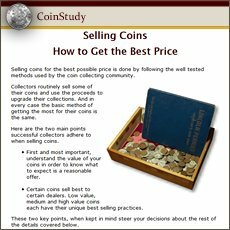 The home page is an excellent index, quickly leading to the major coin series. From Cents to Gold. Each with grading images and value charts.